Santiago is a BIG city, and it can be hard to catch a break. Don’t get me wrong–I LOVE Santiago and its artsy, colorful streets, but it’s really nice to have a quiet place to go that’s outside of the city’s main stretches. 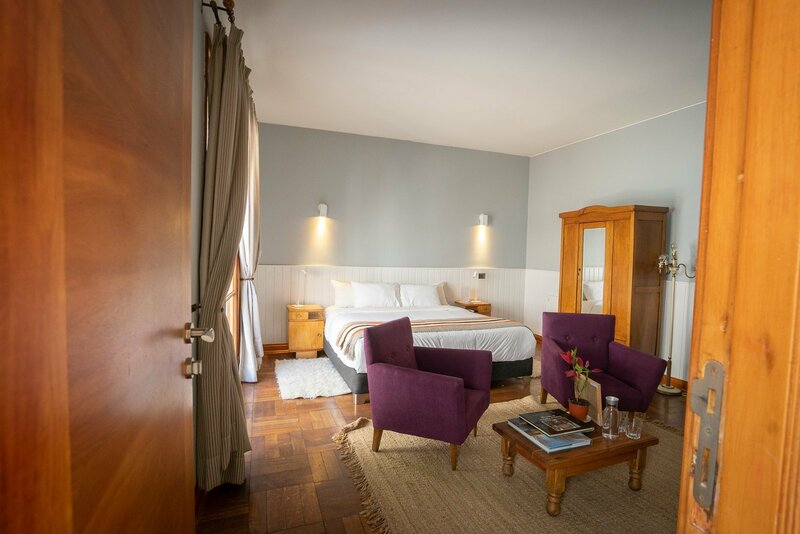 Cue Casa Noble Boutique Hotel, AKA the cutest, centrally-located oasis of a hotel that’s just steps from some of Santiago’s main streets. I think I’m in love. 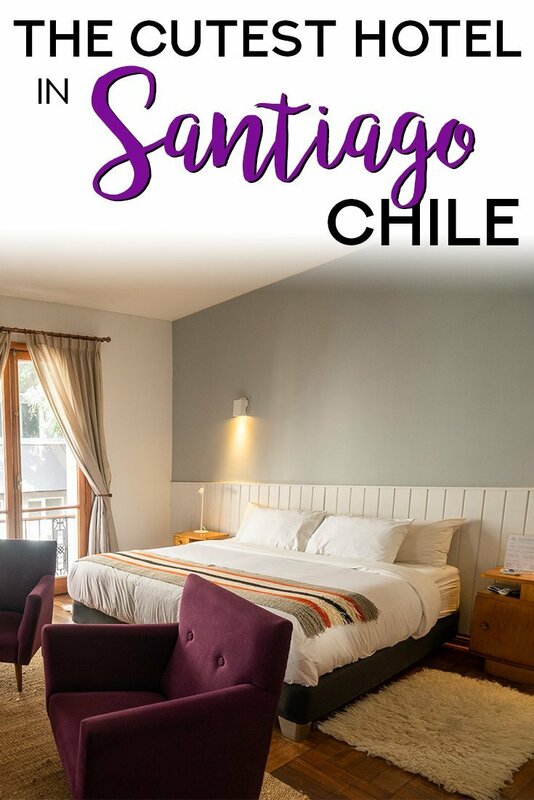 I found this hotel online after searching for small, boutique hotels in Santiago. During my search, I was looking for something cozy, clean, and affordable, and Casa Noble seemed to top the searches every time. What caught my eye was the hotel’s sleek design, gorgeous location in an old mansion, and pretty interior decor. So, I reached out to the owner myself to learn more about the story of the hotel. What Makes Casa Noble Boutique Hotel Different? Casa Noble is truly a boutique hotel. It’s not a foreign-owned conglomerate hotel, and it’s definitely not a massive conference-style hotel. Entering Casa Noble is like entering a big, warm house full of friends, and that’s what I loved so much about it. The owner of Casa Noble, Rocio Valdes, is a sophisticated businesswoman with a knack for hospitality. An architect and designer originally from Santiago, Chile, she used her keen sense of design to create Casa Noble’s open and inviting environment. When I spoke with her, she mentioned that she loved Casa Noble’s location on a quiet cul-de-sac, and its beautiful, spacious layout. Before she bought Casa Noble, it was already a hotel, but she mentioned it was really run down and not well-managed. She closed it, remodeled and refurnished the whole thing, rebranded and created a website, and really started from scratch. Today, it’s a gorgeous 8-room property with lots of personality and light. 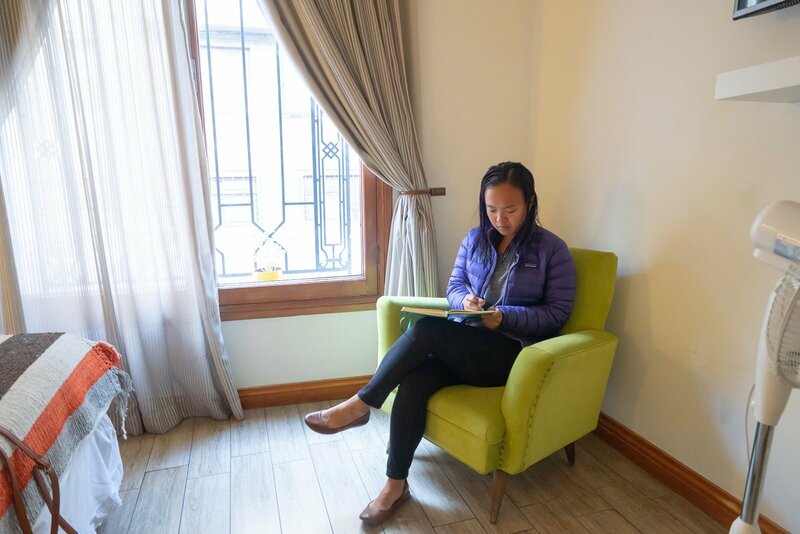 When I asked Rocio her motivations for starting the hotel, she noted that she was extremely interested in design and creating a comfortable home-like experience for guests. But she also mentioned something else: it was her mother’s dream to run a boutique hotel. A few days after she finished the hotel’s remodel, Rocio’s mother passed away. 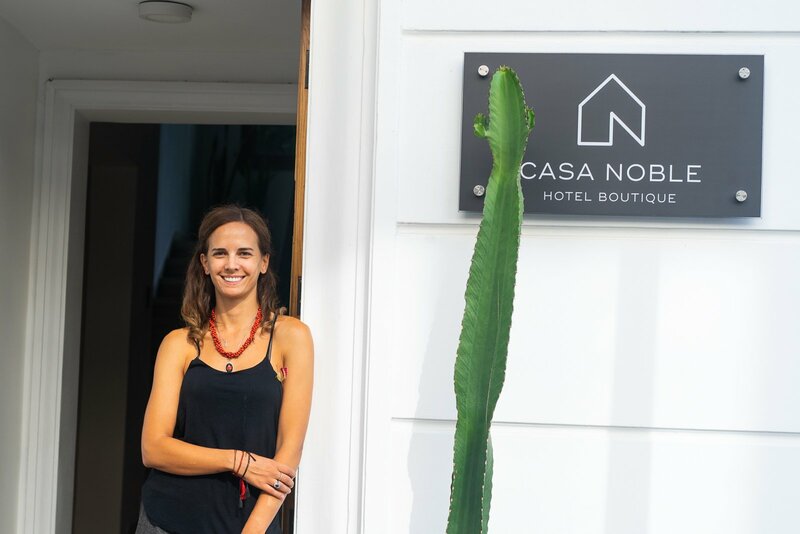 Rocio mentioned that running the hotel is now like realizing her mother’s dream, and that gives her comfort and motivation for her continued work at Casa Noble. Like I mentioned before, Casa Noble is a boutique hotel built into a big, old house. But don’t get the wrong idea–it’s actually totally remodeled on the inside, with big windows and bright, open spaces. There’s a cozy lobby, a spacious breakfast area, and a tiny back patio with lots of plants. When you arrive at Casa Noble, the courteous, English-speaking staff will greet you, and they’re really on top of it. The day before I left, they called my room asking where I was going the next day and offering to organize a taxi for me. I’ve never seen that kind of proactiveness at a hotel, like, ever, so that was a pleasant surprise. Lastly, unlike some of the other boutique hotels in town, Casa Noble is affordable, with rooms often starting as low as $100 USD per night. Located in Bellas Artes, Casa Noble isn’t exactly in a secluded neighborhood of town. But what does make it tranquil is that it’s located at the end of a cul-de-sac, away from the loud, chaotic main streets of Bellas Artes. However, if you want to find restaurants, bars, or cafes in the area, they’re a short 5-10 minute walk from the hotel. I’d leave to grab some mote con huesillo or a glass of wine nearby and be back within a few minutes. Near the hotel, there’s also a laundry shop, a Japanese restaurant, a few bars, the Bellas Artes Museum, and a grocery store. It’s also just a short walk to the Bellas Artes metro station, which can bring you all over the city (I used it a lot to get to the bus station while in Santiago). The hotel staff can also organize a taxi for you if needed. Casa Noble’s rooms were my favorite part of the hotel. As someone who works online and remotely, I need two things: a comfortable space and a strong WiFi connection. Thankfully, Casa Noble had both, and as a result, I was able to rest easy knowing I was comfortable and connected. 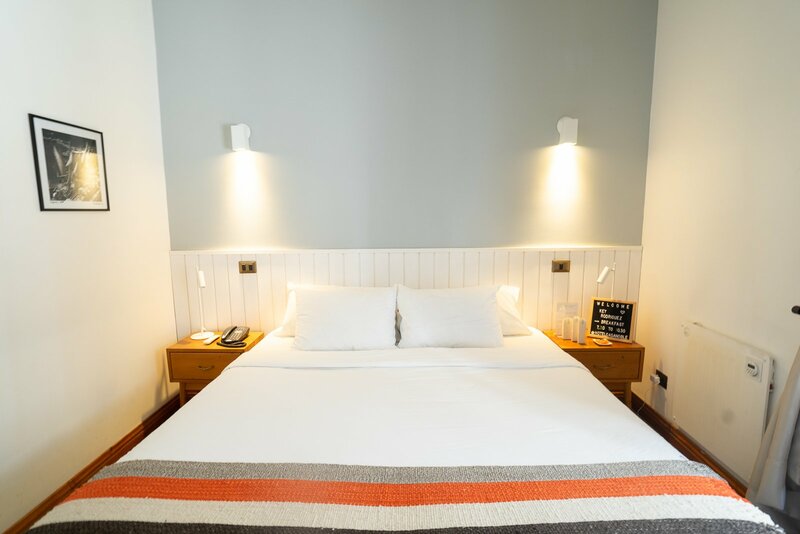 Rocio took a keen eye to lighting and decoration when she designed the rooms. She replaced all of the lamps and furniture to capture a minimalist-type vibe. In my room, a Superior Double, I had a large bed, two side tables, and a cozy armchair by the window. Inside the hotel, there are a few different types of rooms, including a Standard Single, a Standard Double, A Superior Double, and a Double Suite. Rocio let me take a peek into a few of them to see what they were like, and I was blown away by how pretty they were. The bed was super comfortable, the windows were big and bright, and I loved that the hotel toiletries came in bulk and NOT in tiny, single-use plastic containers. Each room also has a mini bar, a TV, and some shelves and hangers for organization. I didn’t use these but I really liked that they were available. Luckily, Rocio used to co-own a coffee shop and cares a lot about the quality of her coffee, so there were always delicious coffee drinks available at breakfast. The buffet was simple but delicious, with fresh fruits, pastries, bread, and cereals. The staff was also on hand during breakfast to make eggs and coffee. I loved grabbing my breakfast and sitting out on the patio, surrounded by plants and away from the noise of zooming cars and people talking on cell phones. 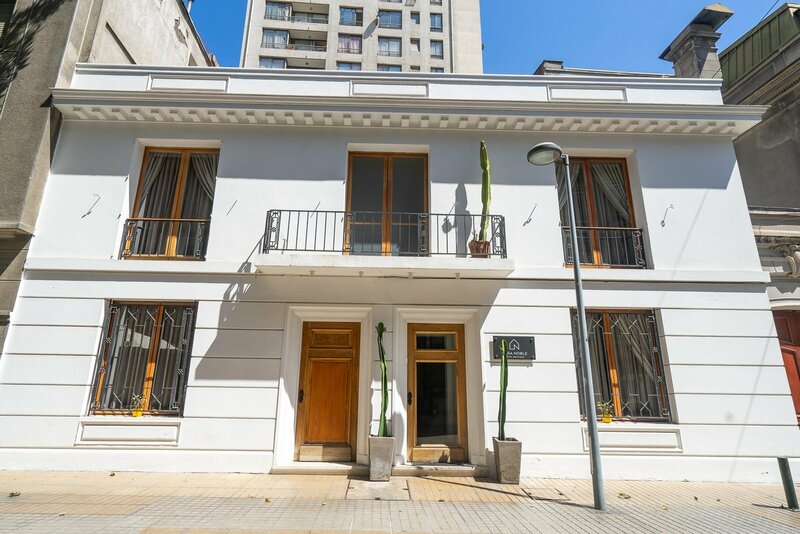 I’ve been to Santiago five times and stayed at a wide variety of places, ranging from high-end chain hotels to Airbnbs to hostels, but my favorite out of all of them is definitely Casa Noble. 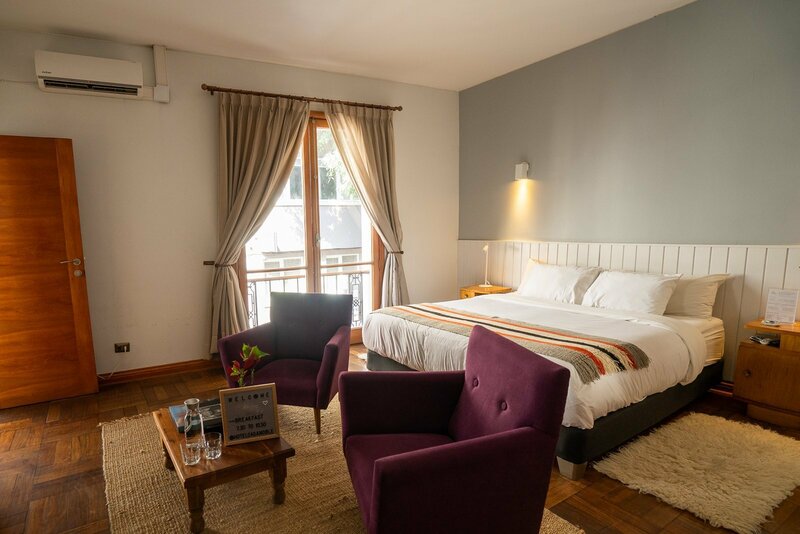 If you’re looking for a centrally located, quiet, cozy, and spacious boutique hotel, I highly recommend Casa Noble for any kind of traveler, and I’ll definitely be back next time I’m in Santiago. You can reserve a room on Casa Noble’s website, or on Booking.com. Rocio and Casa Noble Boutique Hotel graciously hosted my stay in Santiago, but I wouldn’t be recommending them if I didn’t LOVE their property. As always, all opinions, words, and weird obsessions with interior design are 100% my own. Did you find this post helpful? Don’t forget to bookmark it or pin it for later!